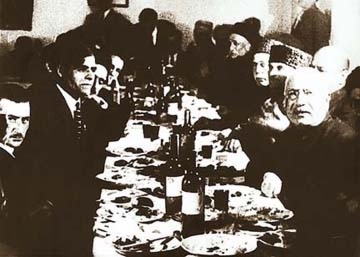 In 1926, Baku hosted the First Turkology Congress, which brought together representatives from Turkey and the Turkic-speaking republics of the Soviet Union [Turkmen, Kazakhs, Kyrgyz, Uzbeks, Azerbaijanis and Tatars]. 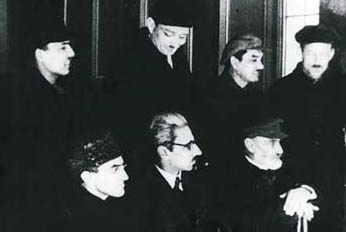 Left: Delegates to the Turkology Congress in Baku gathered to debate whether to use the Arabic or Latin script for Turkic languages. Stalin arrested and executed or sent into exile most of the participants of the Congress in the late 1930s. Photo: National Archives. Representatives from "minor" Turkic-speaking groups living inside Russia were also invited, including the Chuvashis, Sakhas (Yakuts), Khakases and Balkars. The main question on everyone's mind was: Should we reform the Arabic script so that it more fully expresses the phonology of the Turkic languages, or should we adopt a completely new script - a modified Latin script? And can we decide upon a single unified alphabet that all of us can use? Right: Delegates to the Turkology Congress came from Turkic-speaking nations from Turkey to Central Asia. Photo: National Archives. A heated debate followed for eight days - February 26 to March 5. Fortunately, a stenographic transcription of the Congress still exists, enabling us to understand the intensity of some of the arguments between the Arabists and Latinists. Some of the arguments are insightful and based on scientific and linguistic knowledge; others are prejudicial and border on absurdity. But reading these documents makes us appreciate how conscious the early reformers were about making such a momentous decision in history. Little did they realize, however, that they would become mere pawns in the grander scheme of Soviet planning to eradicate Arabic entirely, in order to get rid of any associations with Islam. Hardly a decade would pass before all of these efforts for Latinization would be undermined, and Cyrillic would be emphatically imposed on all of the Muslim nations of the Soviet Union. 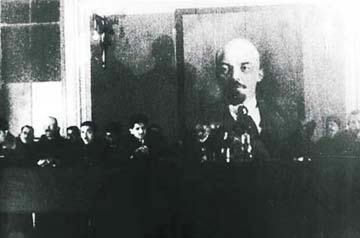 Left: Turkology Congress held in the Ismailiyya Palace, Lenin had died two years earlier. Photo: National Archives. Despite the seeming failure of the Latin movement to make much headway in Azerbaijan during those few years (between 1922-1939), these early efforts for Latin became a critical factor 50 years later when Azerbaijan gained its independence in 1991. Within a few short weeks, Parliament voted to adopt Latin as the official alphabet. We've chosen some of the more dramatic arguments as a sampling of what went on during the 1926 Congress. Peskov: There is a lack of understanding among individual nationalities [of the USSR]. In order to do away with this problem once and for all, we Russians, who have been more fortunate in receiving an education, should pay more attention to our backward Turkic brothers. We won't be able to do this until we have a common language and a common writing system. It's no secret that learning Turkic languages through the Arabic script is extremely difficult for Russians and other nationalities. Left: Stalin decreed that all Turkic-speaking nations adopt the Cyrillic alphabet. 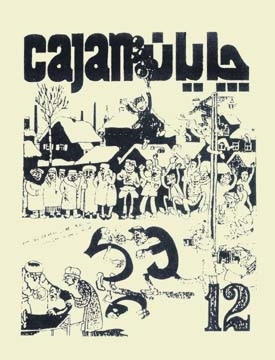 Here in the Tatarstan publication, Chayan (1928), the caricature shows the same sound represented by Arabic (left) and Cyrillic (right). Onlookers are cheering or crying and the press is photographying the battle. Azerbaijan adopted Latin in 1923 but was forced to change to Cyrillic in 1939. Right: Samples of Arabic script from various Turkic-languages, totally incomprehensible to one another. Molla Nasraddin magazine. Yakovlev: When implementing alphabet reform projects, we should take into consideration the social and cultural conditions of each individual nation. The ease in adopting Latin is inversely proportional to the development of writing in that nation. The higher the level of literacy, the more difficult it will be to carry out reforms. So far, Azerbaijan has been quite successful in introducing reforms. There are two reasons for this. First of all, the level of literacy is not very high throughout the country. Second, the national proletariat is concentrated in one place - Baku. If we look at the territories of the Muslim nationalities, we see that the Arabic alphabet loses its historical role from territory to territory. Zhirkov: Today, along with the tendencies toward adopting Latin, there are tendencies toward reforming the Arabic script. We have to consider the fact that the Arabic alphabet was designed for meeting aesthetic principles. Therefore, it is appropriate only for handwriting. The extreme beauty of the Arabic script makes it difficult to produce from a technological point of view. The main principle for an alphabet should be its clarity and distinctiveness. But the Arabic alphabet is prized more for its aesthetic value. Galimjan Sharaf: I agree that the Arabic alphabet does not symbolize all of the phonetic possibilities of the Turkic peoples, but neither does Latin. To reflect all of the sounds, the Turkic peoples must invent symbols or add lines and dots to the existing symbols in the Latin alphabet. When Comrade Aghamalioghlu brought up the question of adopting Latin, Comrade Lenin asked: "How will the peasantry feel about this?" Photo: Samadagha Aghamalioghlu, Chairman of the 1926 Turkology Congress. Aghamalioghlu answered: "They are well-disposed." Lenin replied: "This is a revolution in East!" However, I would like to dwell upon Lenin's question and Aghamalioghlu's response to it. I think Aghamalioghlu was mistaken when he thought the peasantry in Azerbaijan would be well disposed to the adoption of Latin. The statement that Arabic symbols are hard on the eyes is not true. How many people in the East wear glasses, even among those who do a lot of reading and writing? The fact that we have to wear glasses is a legacy from the Russian system of letters. Also, the Arabic system of writing corresponds to the natural movement of the hand in a clockwise fashion. But when you write letters that are frequently used in Latin or Cyrillic, such as "o", "e", and "b", you have to use a counter-clockwise motion. Umar Aliyev: Even progressive Arabs complain about the difficulty of the Arabic script. They say: "In Europe, words are written so that you can read and understand them. In Arabic writing, you have to figure out the meaning of the word before you can pronounce it correctly" [because short vowels are not expressed]. Let's assume you are writing the word "gazanfar" [lion]. In Arabic, you write only consonants, g-z-n-f-r. Using all 12 vowels [and diphthongs] of the Turkic languages in all possible positions, you could come up with at least 60 different ways to read this word. It's true that the hieroglyphic nature of the Arabic script makes it faster to read words. But the advantages are only easy for scholars, not for the average person who is just learning to read. Plus, if you're not skillful in writing the Arabic and you put a dot a little farther away from a given letter or closer to it than it should be, you can create great confusion for the reader. The Arabic alphabet was designed only to be written by hand. That's why it has tails after letters. That was a requirement of handwriting. But what does technology require now? Cutting off these tails. Now the Arabic script is facing a dilemma. Writing and reading requires that there be tails for differentiating the letters, but technology requires that there be no tails. Cutting off the tails would make the Arabic alphabet difficult to read. Galimjan Sharifov says the Arabic alphabet was designed so as to correspond to the natural movement of the hand. But what about the dots that are placed using a counter-clockwise motion? And consider the problem of numbers, which are written from left to right - this totally contradicts the direction of writing the Arabic letters. Sultan Majid Afandiyev: Some opponents of the Latin alphabet say that the project will involve a lot of expense and effort. But we shouldn't retreat. This expense is nothing compared to the value of reform. Mirza Mulkum Khan, one of the Latinists from an earlier period, has said that the reprinting of the entire literary heritage of the near East would cost the same amount as the construction of a battleship. I'm not saying that we have to do away with the Arabic entirely. For the research of literary documents, Arabic may be used and studied. Let's take Germany, for example. They use the Gothic as well as the Latin script. Baytursun: An alphabet is only a set of symbols. We should raise the issue of an alphabet where it does not exist or does not meet the requirements. But we don't have such a difficulty. The main requirements for the alphabet should be: 1) capability of reflecting the sounds, and 2) technical convenience. If we don't have vowels, we need to create them on the basis of the Arabic alphabet. These days we have so many other problems - printing books, compiling dictionaries, writing grammar books. We should direct our energy toward these vital projects. Our people are suffocating in dug-out houses along with their cattle. If you want to help us, do something concrete. Someone was mentioning music scores [and the fact that music is written left to right and Arabic is right to left]. But do we have so many singers in the Turkic world that we should change our alphabet just for their sake? Let's see what happens 10 years from now. Right now is not the time for these things. Aghamalioghlu: Supporters of the Arabic alphabet are saying: "We have a 500-year cultural heritage. We don't want to lose it." Yes, we do have Fuzuli and Navai [two Azerbaijani poets]. But what was the level of society at that period? They were only individual personalities who emerged in an era that was not highly cultural. Today some of the Turkic actresses say: "Our theater has a 50-year history." But, tell me, what kind of theater was it where men had to play women's roles? The Arabic alphabet is composed only of sticks [shaped letters]. If you take out the dots, you're left with sticks. How can you reform an alphabet that only has sticks? The Latin alphabet has sticks and circles enabling you to create a huge number of combinations [modifications] with it. 1. A specific unique symbol should represent each phoneme. 2. Symbols should be Latin or derived from Latin letters. 3. Russian letters should be avoided. 5. Avoid any duplication of symbols [Arabic had four]. 6. Avoid diacritic marks [like dots]. 7. Avoid diphthongs [the use of 2 or 3 letters for one sound (phoneme) [such as "ou" or "ae", "sh" or "ch"]. 8. Avoid using special marks to designate soft or hard consonants or long vowels. 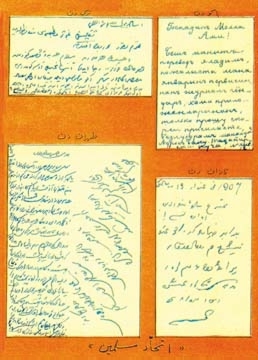 These excerpts from speeches at the First Turkology Congress in Baku were compiled and translated by Jala Garibova from an untitled, Russian stenographic transcription of the Congress in 1926. Deep appreciation goes to Anar (Rezayev), President of the Writer's Union of Azerbaijan, for making these rare documents available to us.